There isn’t much between these teams in the Euroleague and this means this could be a close match. The teams played each other four times back in the 2014/15 season and it was the Turkish team that triumphed every single time. 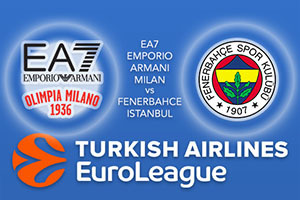 Whether this provides Fenerbahce with confidence or it further motivates Milan remains to be seen but this is definitely a Euroleague game between sides that know all about big games that matter. The Italians have had a strange season so far with many up and down moments. The 4-4 record has been achieved with a lot of points and Milan are currently the third-ranked scoring team in the league with an average of 89.5 points per game so far this season. Rakim Sanders has been in fine form the Milan side with an average of 14.3 points per game while Alessandro Gentile has chipped in with an average of 11.5 points per game. There is also Ricky Hickman who has been on hand with an average of 11.1 points per game so far for the Italians. If you’re looking for a team with plenty of fire-power, the Italians are up there with the best this season. As the runners-up in last season’s Euroleague, Fenerbahce knew that there was a lot of expectation placed on them but so far, they have managed it well. At one point they looked as though they were going to fire through the league but their 5-3 record is a fair assessment of where the team lies at the moment. There is no reason why they cannot deal with Milan in their own backyard and you should look for this game to be one of the tighter games of the midweek. Kostas Sloukas has been in fine form for the Turkish team with an average of 12.1 points per game while Jan Vesely has provided an average of 11.9 points per game with Bobby Dixon chipping in with an average of 11.8 points per game. The fact that this game is likely to be a close-run affair is seen in the bookies’ odds. You can take Fenerbahce at -1.5, which is provided at odds of 1.90. You will also find the Over/Under market available at OVER 166.5 at odds of 1.90 for this Thursday night clash. Bet Now!